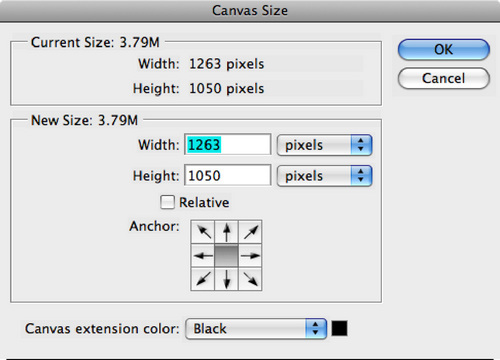 Any image in Photoshop is supported on a ‘canvas’ that is usually the same size as the image. If your image does not fill the projector frame in width and/or height, then you should increase the canvas size to fill the unused parts of the projection image frame. The image then appears to be mounted on a larger black mount that fills the frame. Use Image>Canvas Size or its equivalent in your version of Photoshop. In the example dialog box we have an image that does not fill the width of the SXGA+ projection frame, which is 1400 pixels across. The 1050 pixel height is correct. Use the drop down menus to change the units to pixels if necessary. Change the canvas extension colour to black using the drop down menu at the bottom. The little picture marked Anchor, with 9 x 9 squares, shows what Photoshop calls the Anchor point, whose location is indicated as the black square. The canvas is extended relative to this Anchor point. If the Anchor point is in the centre, then the canvas is extended symmetrically about the image. If it is at top centre for instance, then any height extension will extend below the image, and equally to both sides. For our purposes the anchor point should usually be on the centre square. Click on the appropriate destination square to switch the anchor point if necessary. Then any possible canvas extensions will be spread on both sides and/or at top and bottom. The height here is 1050. We change the width to 1400 and press OK. The canvas now shows as a strip of black at either side, about 114 pixels wide (1400-1263/2 = 113.5). In this procedure you need to change the dimension that is too small. If your width is 1400 (1024 for XGA) and height less than 1050 (768 for XGA) , you change the lower height figure to 1050 (or 768 for XGA). On the other hand if the width is less than 1400 (1024 for XGA), and the height is 1050 (786 for XGA) you change the width to 1400 (1024 for XGA). You might have an image which is small in both directions, in which case you would change both height and width boxes to the correct image frame sizes, and get a canvas extension on all sides. Click OK when you have the right numbers in the boxes to see the result. Save a copy as a high or maximum quality JPG. In some competitions and events either JPEG or TIFF might be acceptable. Check the actual rules to be sure. Note that Photoshop (.psd) documents are not normally suitable for projection. © Michael Wood, 25 October 2008. Click the link to open a new window displaying an Adobe Acrobat Reader file (PDF) that you can print and/or save. Images on this WGPS site are copyright of their respective authors. You must obtain permission to use them. Text may be used for non-commercial purposes with appropriate acknowledgement.